Through a series of excursions, I bring to you some ground-truthing in Cape Romain National Wildlife Refuge, SC as an amateur naturalist. My friend Charlie McAlister often navigated these waters with me in his small wooden skiff. For an examination of the geology of the Cape Romain area, see Part 1: Decoding the structure of Cape Island. Over a year ago in November 2014, Charlie and I arrived at Cape Island early in the day. 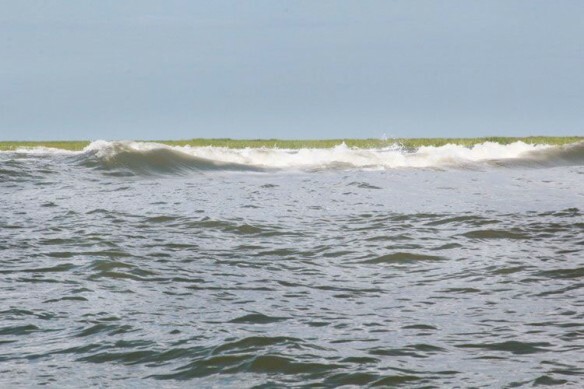 It was a high enough tide to pass over the shallow waters near the wide breach in the center of the island. The tide fell and we were left at the beach all day. 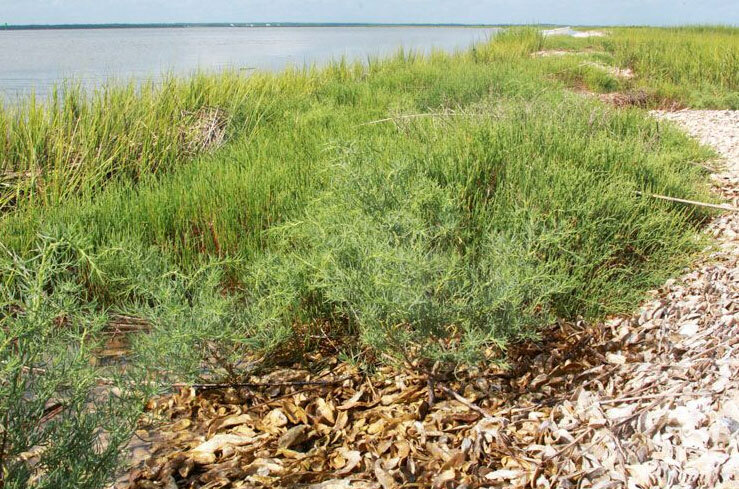 Sea Oats and Sweetgrass were established on the beach away from the ocean’s edge. A little cliff defined a line behind which older vegetation thrived. 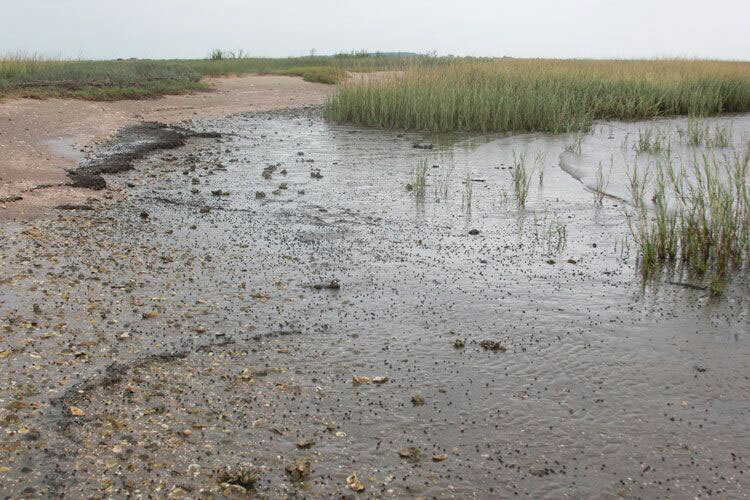 Mud with clams embedded and the cut-off roots of Spartina lay in huge chunks on the shoreline. This is evidence that where the mud on the beach is located was once marsh, the backside of an island, protected by a beach once offshore from here. 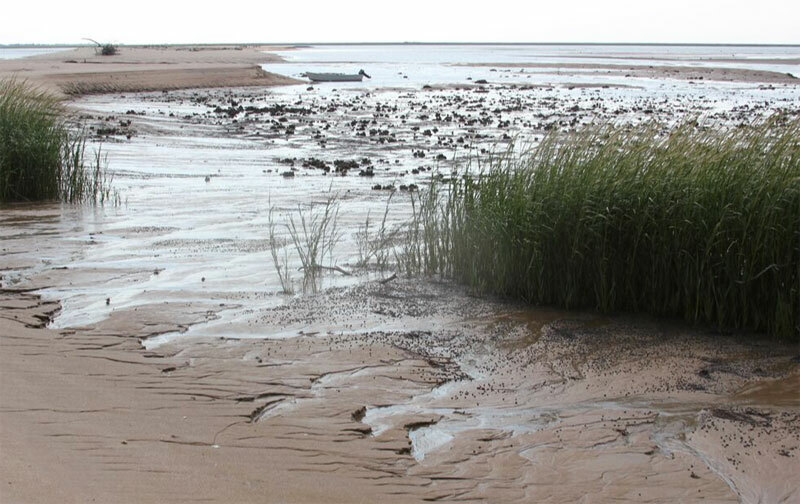 Spartina, gone to seed, thrives behind the island where washover has not yet occurred. The beach is steep and receding. As sand washes into the forest, life struggles to hang on. 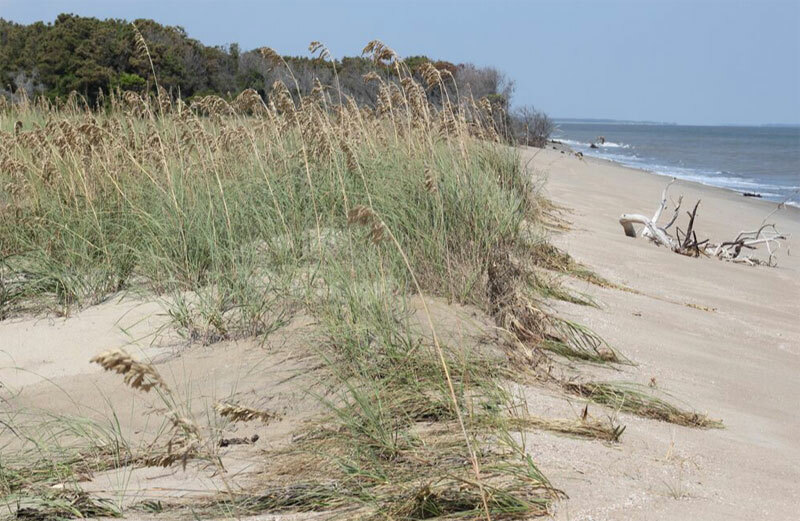 Classified as a thin, retreating barrier island, Cape Island is on a slow crawl landward. 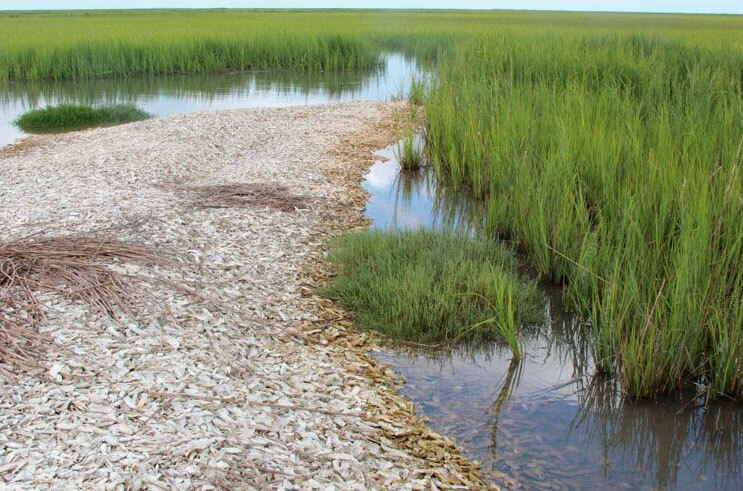 Eventually this inundation will incorporate the marsh behind it, resulting in the conversion of salt marsh to tidal flats, then to open ocean. 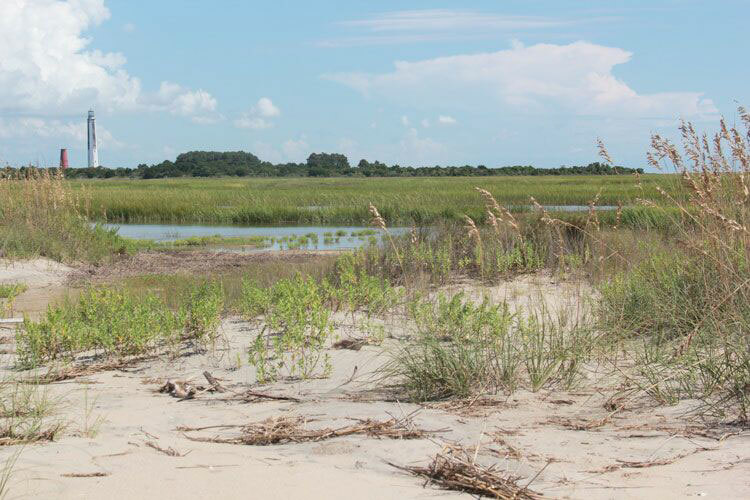 (1) The sand can move with the rising seas but the marsh will struggle to survive. 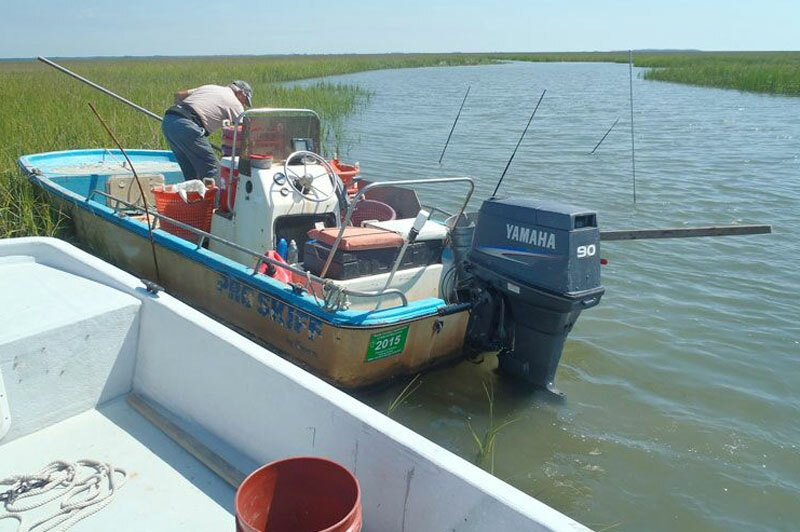 In summer when oysters are out of season, many turn to crabbing or clamming to make their living in Cape Romain National Wildlife Refuge. 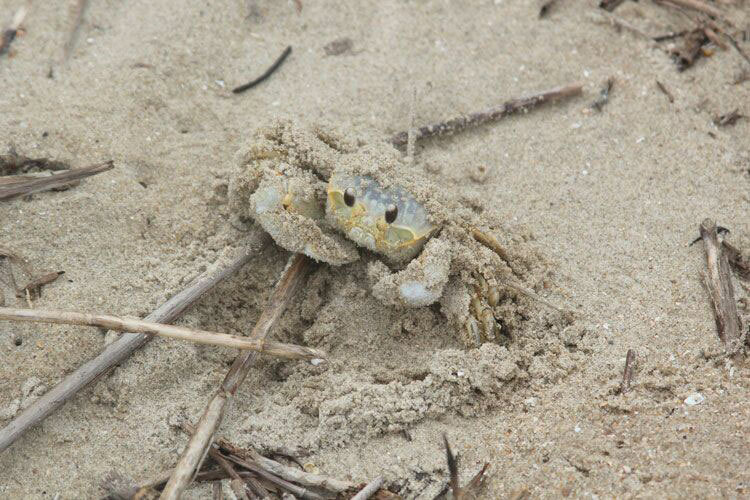 Crabs molting in the spring allow for a short soft shell crab season. A building filled with tanks on the bank of Jeremy Creek in McClellanville, SC serves as a holding facility for the crabs, moved from tank to tank by hand as they begin to molt. Having been acquainted with Darryl and Ronnie who manage the crabs at Livingston’s Seafood, I walked up and bought two for dinner wrapped in paper on a spring afternoon. 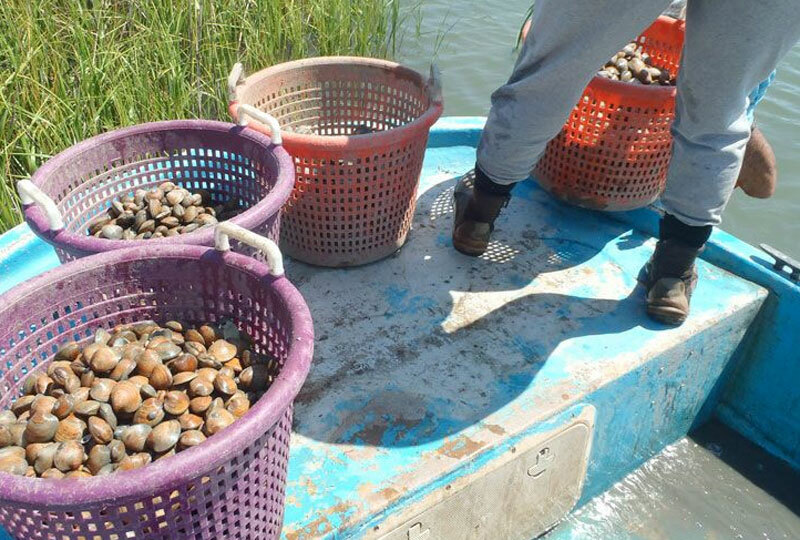 An excursion to the clam beds with Julie McClellan and her business partner, Irving, allowed me to see the process of raising clams in the natural environment in the early summer. 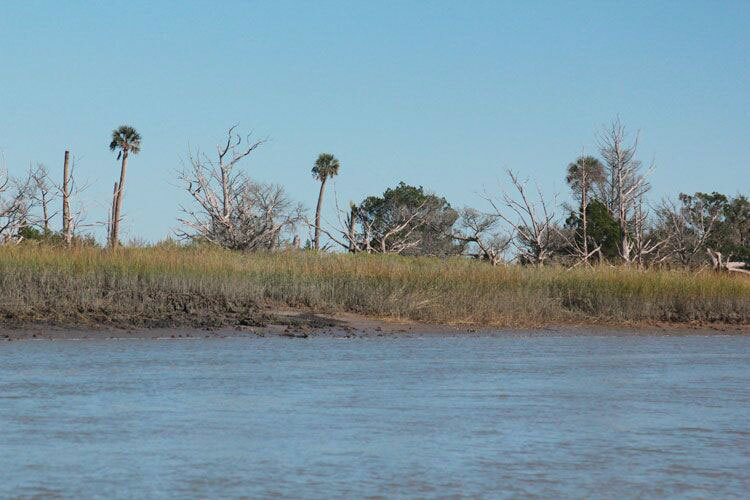 Moving through the curving waterways, Spartina blocks the view from the deck of the small boat. Julie points out an old tower used as a place marker which was turned over in a storm last winter. Crabbers, clammers and shrimpers are out here working in the waters that have just gotten warm. 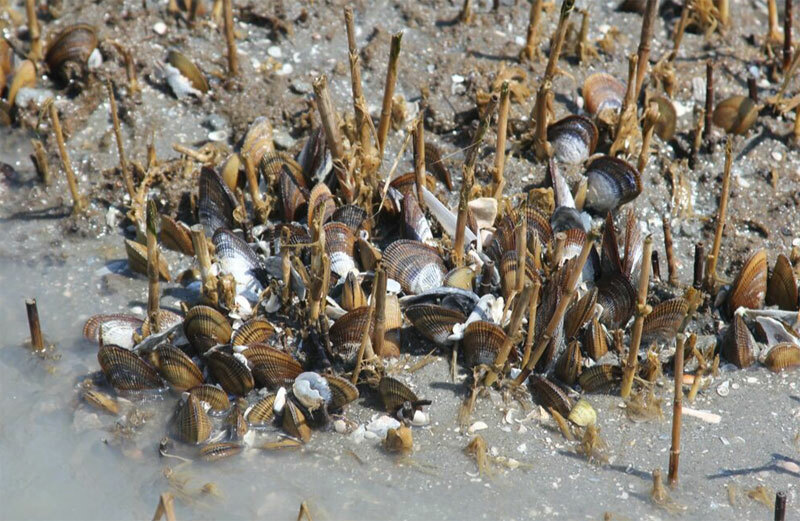 The clammers mark their plantings with rebar or PVC pipe. Passing in the early afternoon, I see the DNR has thrown a cast net along the river bank, surveying all the creatures found. The day I observed the clamming, we collected bags previously placed in a hard-bottomed creek with flow from the ocean moving through to clean the clams. These bags had been placed there the day before, moved from the muddier location. Later in the day, we collected bags from the mud, pulled up by hand and hosed out in the water with a gas-powered pump. These bags were motored back to the creek spot when the tide was lower and could be tossed out into the center of the creek. The rushing tide will leave these clams pristine when they are collected, to be sorted and counted the next day. Clam seed is bought then raised over many months in mesh bags or placed under grating in the mud. 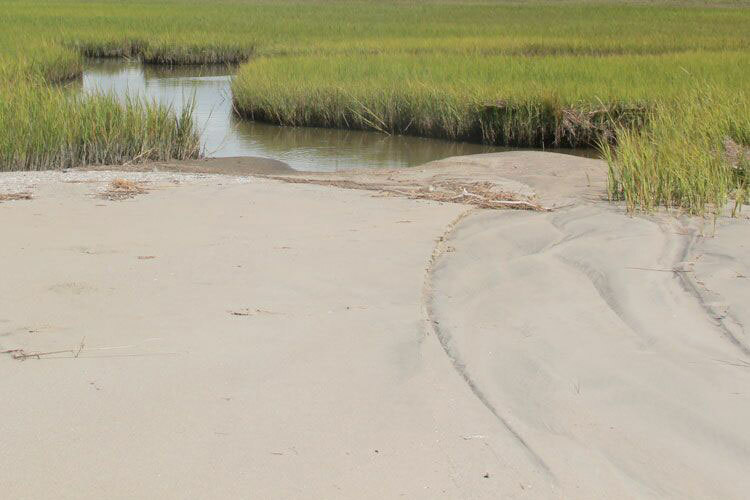 This prevents predation and these areas are marked to allow clams to be moved so that they aren’t buried by sediment. 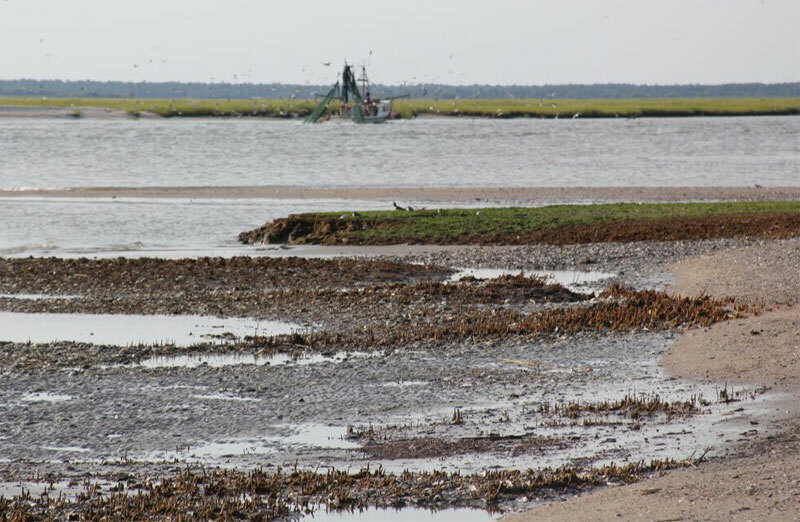 Clams do better with the grating system, Irving says, because it is a more natural environment and less mud collects on the grating than with the bags. Bags make the collecting and moving of clams much more efficient however. 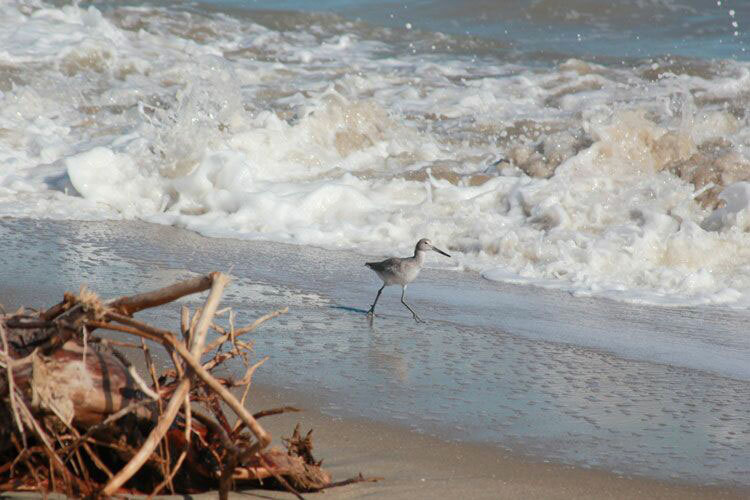 Charlie is here for the summer and ready for some exploring in Cape Romain. 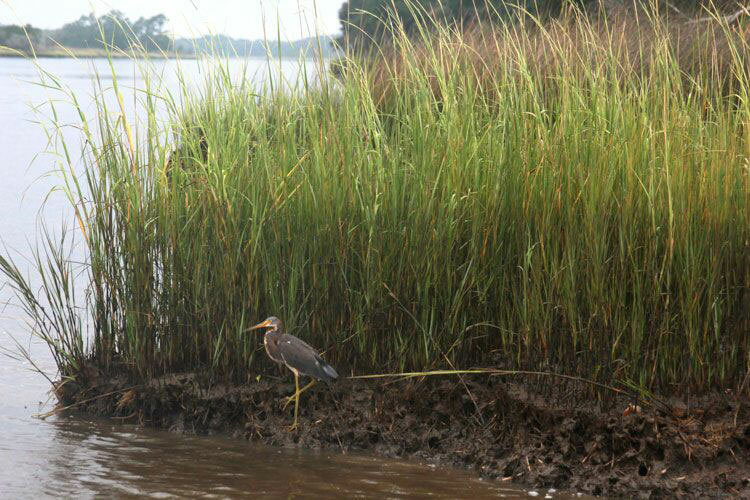 We exit Jeremy Creek from the McClellanville public boat landing and pass over the Intracoastal Waterway, into where the broad Five Fathom Creek goes south toward Bulls Bay and the ocean. Near the inlet of Five Fathom Creek is tiny Clark Creek on Raccoon Key, our destination. But on this day in early August, we don’t get that far. His motor is acting funny so we don’t want to push it. Oyster shells are piled up on the banks, shining brightly in the sun, along the east side of Five Fathom as we approach the ocean. 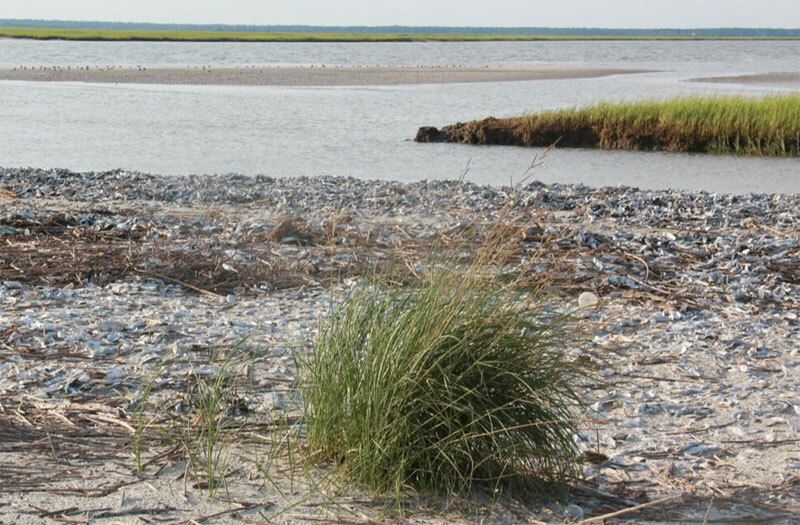 Wrack lines of marsh grass on the shell banks show evidence of three recent storms. (2) The shells are bleached by the sun and some are riddled with holes from oyster drills. I don’t see any sign of living oysters on this creek. 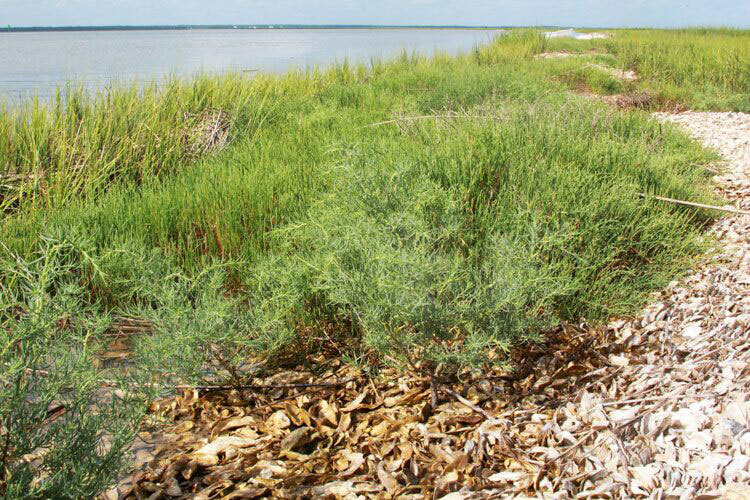 Lime green Saltwort and the bluish Southern Sea Blite grows lushly in the shell piles and Spartina abounds into the marsh. Riding out to the end of Five Fathom Creek, the depth is over 30 feet, but becomes shallow quickly where Sandy Point disappeared below the water. Sandy Point was the mile-long spit of Raccoon Key used to obstruct the inlet to Five Fathom Creek. 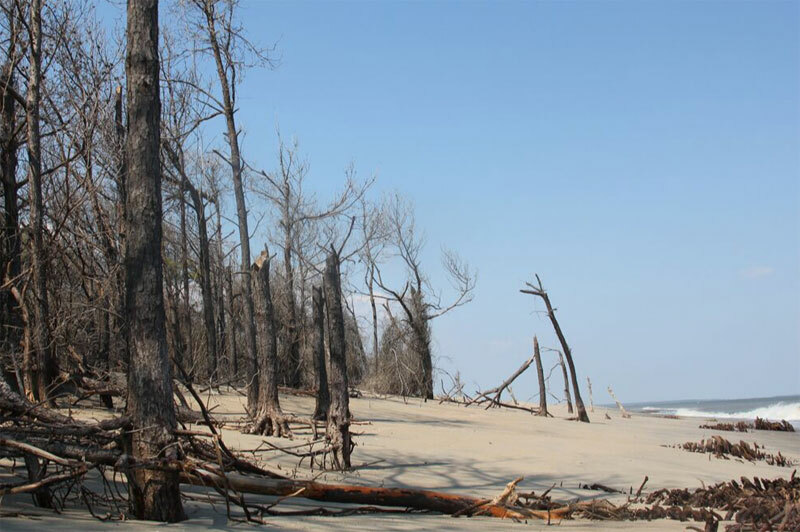 By 1994, Sandy Point had disconnected and by 2006 was nearly gone, rapidly eroding thereafter. (3) Swells prevent our crossing of Five Fathom Creek. Waves break over the shoals and strike the steep bank. We walked up the beach from the west and the scene grew increasingly desolate. Chunks of mud began to appear on the beach. Almost all the plants were gone where there used to be thick vegetation at the end of the island. There was barely a dune line with a small patch of Sea Oats hanging on. The sand was washing over into the marsh creeks. Since last year, it looked like almost all the Spartina grass had died and a small creek was now a few hundred feet from breaching here. Across the inlet, the sandy southern spit of Cape Island has about ten people out with their umbrellas and chairs, and a few boats are anchored in the inlet enjoying the holiday weekend. 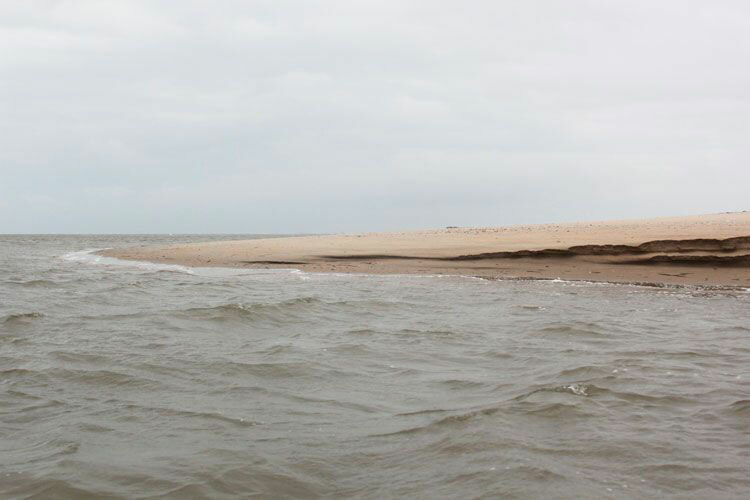 On the end of the island, the dunes are high, and the water looks even higher. We return to the boat so that we can approach the southern spit from the other side of the lighthouse. It is high tide, otherwise the silting of the inlet here would stop us from taking this route. 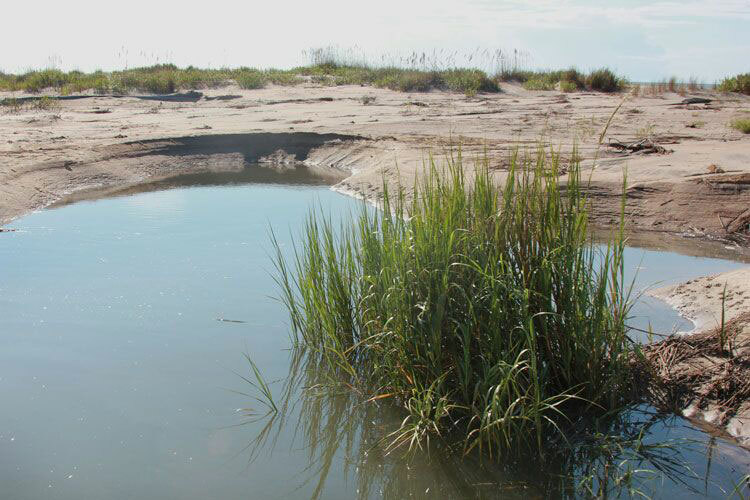 Tongues of sand extend below the water and a curling tip of sand flows back into the inlet. We attempt to go north and see more of Cape Island, but as we approach the new inlet in the center, we encounter unknown sand bars. 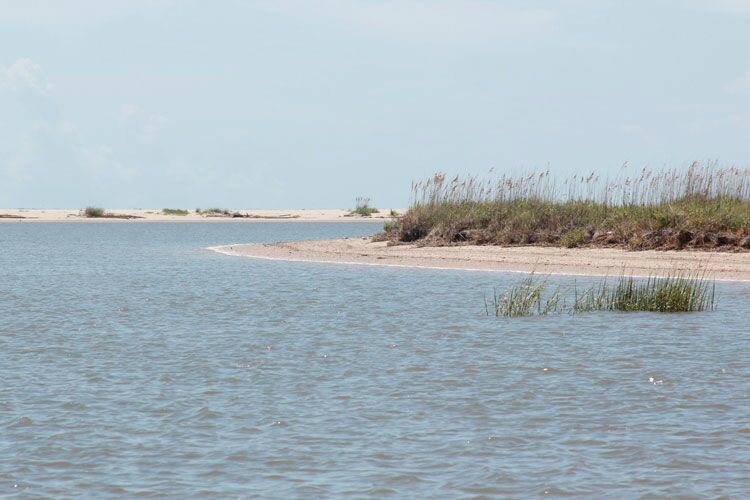 Newly formed sand islands have signs posted that mean they are temporarily closed as bird habitat. At the end of September, after a seven foot high tide (infrequent here on a mesotidal coast) and weeks of rain, we went out to see the north end of Cape Island. (5) The water was amber-brown with fresh water. Organic matter from the runoff made patches of suds in the turbulence. (6) Even though summer is only passed by a few days, winter looks like it has taken hold on this overcast day. The wind is blowing from the north, straight into our faces. The north wind is typical of the winter season. A cool front has stagnated, so we are free from the storms that we see in the distance. We take an entrance to a small creek we’ve never taken, avoiding the open waters of Muddy Bay where the chop would spray us. This is Ramhorn, a very skinny, winding creek. 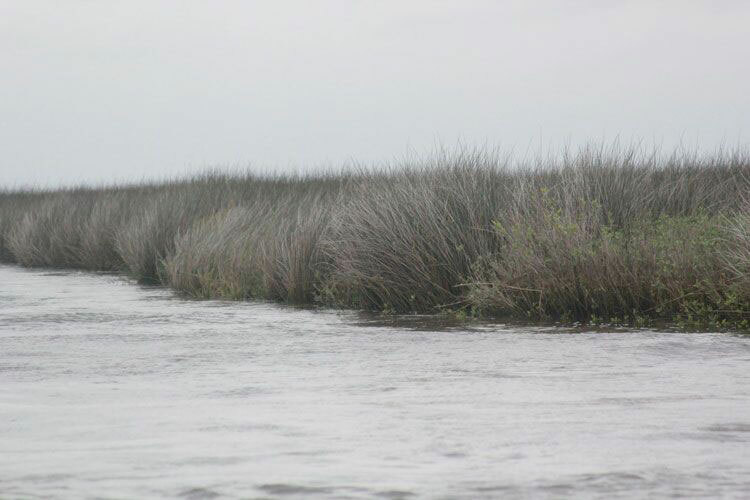 We begin to see Black Needle Rush mixed with the Spartina as we move only a mile or so north of our McClellanville departure. 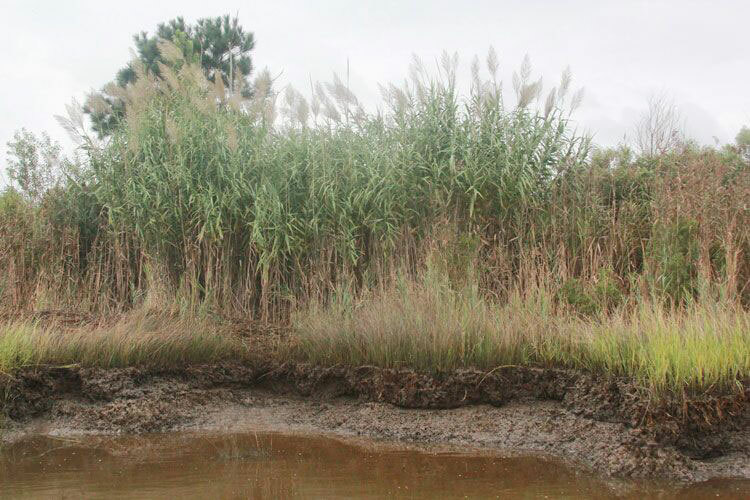 Rush requires more fresh water than the more salt-tolerant Spartina varieties. The Santee Rivers, about 8-10 miles to the north, contribute abundant fresh water to this area, but the irregular distribution of Needle Rush is more complex than that. Right here in Ramhorn Creek, the Rush grows on high, clay banks. As I stand up on the bow as we ride, I observe pockets of rainwater trapped in pools. My guess is that this is an older creek, at slightly higher elevation, and the clay substrate (as opposed to the silty, muddy conditions normally encountered) has kept the rainwater from draining completely. The plant life here is crushed by the tide. Saltwort, grasses, and Prickly Pear cactus survive the frequent flooding and constant salt spray. 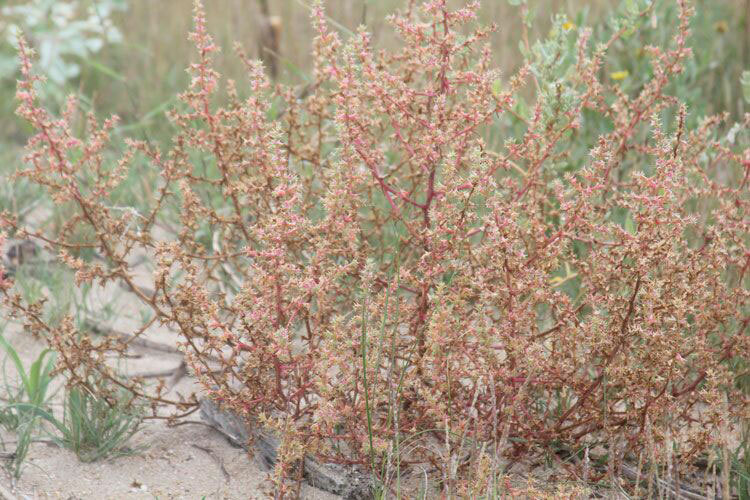 Abounding are Seaside pennywort, with long drought-resistant roots, and Beach Pea, a leguminous vine with a green bean-like pod. 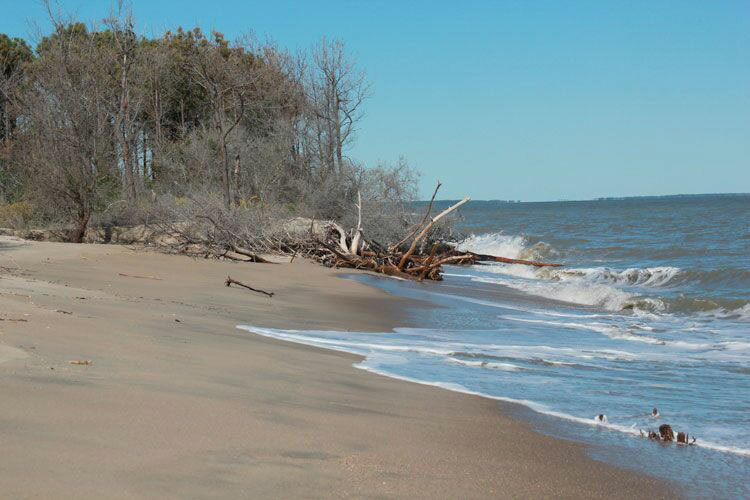 There is a sandy bank about 100 feet wide, and the higher, older portion of the island is defined by a small cliff that is slowly eroding. 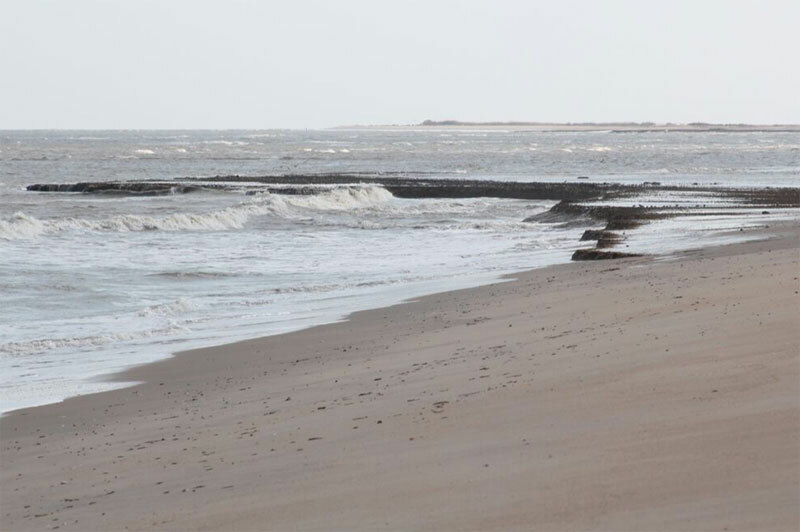 The distance to the ocean-front beach is about ¼ mile across this recurved spit. 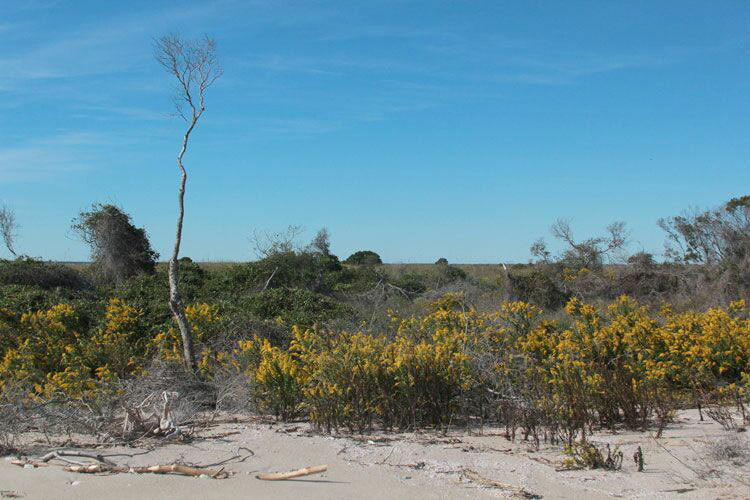 Dunes on the shore are visible, and the Sea Oats that hold them in place on the horizon. We get back in the boat and motor up to the tip of the north spit. 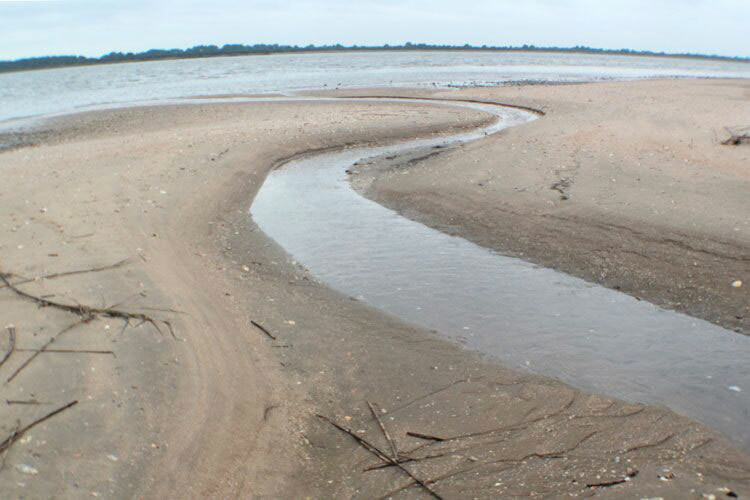 The wide sandy bank here is a feat of nature, seeming to grow in spite of tremendous tidal forces. In mid-October, I took a walk across the narrow northern spit of Cape Island after we travel half an hour by boat from the village. 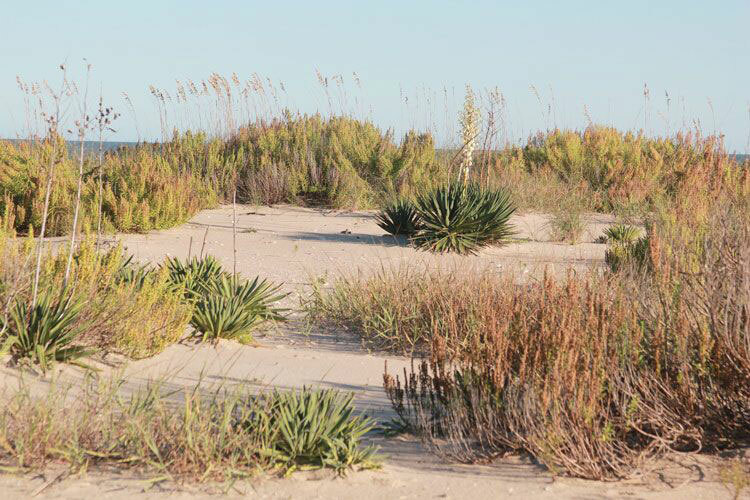 A variety of shrubs, slow-growing cactus and yucca can be found on this oldest part of the island. 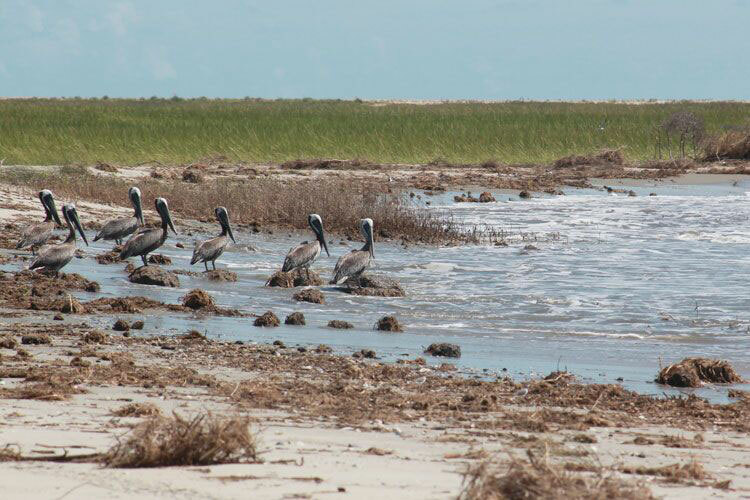 On the beach, every few hundred yards are creeks that flow into (and drain) the island. 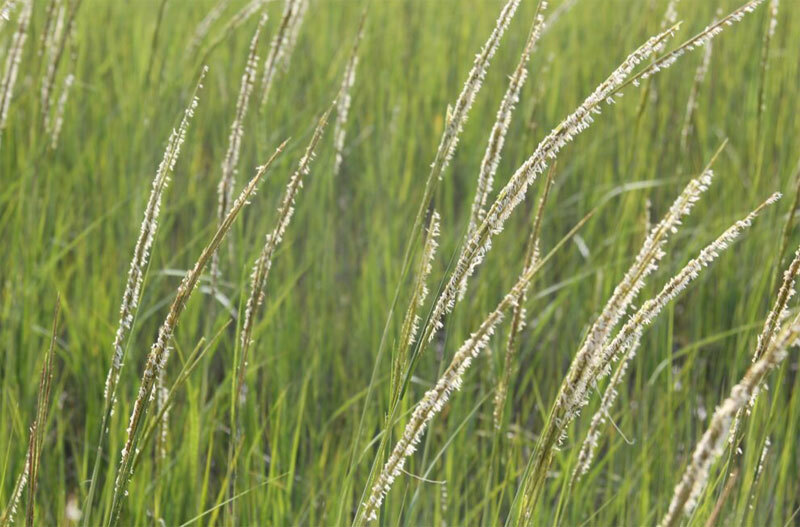 The wrack of Spartina grass provided a pathway to walk on, then I found a sand ridge where Seaside Goldenrod and yellow Camphorweed were blooming and try to avoid the thick boggy patches of Oxeye which are coarse and scratchy. These sand ridges come in bands that have developed northward over time, growing like an oyster shell. 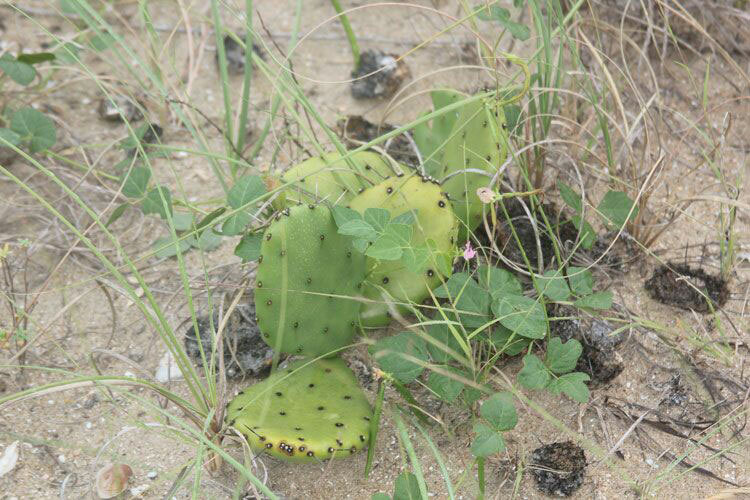 Fruiting cactus and Spanish Bayonets were surviving on the higher sandy patches. 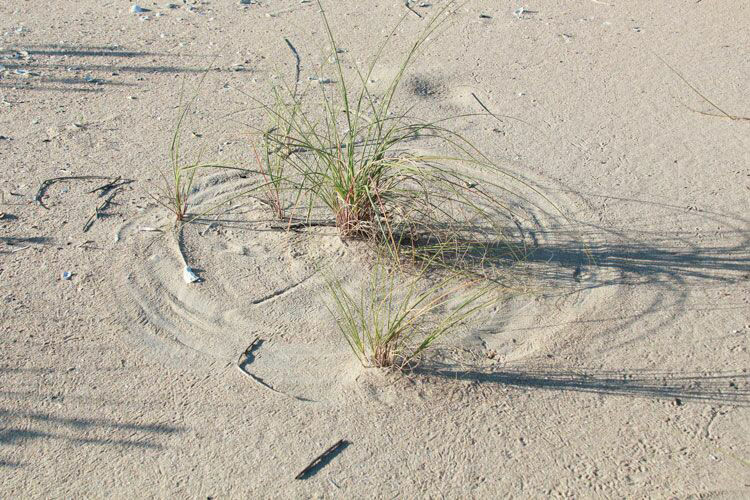 These plants are important to stabilization as they capture windblown sand, seen at their bases. We came here two weeks ago but the soggy conditions made this walk impossible. A line of Sea Oats hold the dunes here, only a single row. I find a low spot to walk through to access the beach. If this place was more accessible, it would not be in such natural condition. I come out on the beach to see surprising geometry in the sand. A line of triangle-shaped ridges (only a few inches high) are equally spaced, punctuating the beach. This is an intriguing pattern, and I guess it must be the result of forces colliding on the beach, perhaps waves striking each other from opposing directions to create these regularly spaced triangular bulges. I’m not sure exactly how to read these lines in the sand. On the way back from Georgetown on October 18th, we detoured to see the central breach in Cape Island again. We approached from the edge of the point to avoid the unknown hazards from silt and sand in the water behind the beach. The tide was coming in so there was limited view of the low-lying sand formations. There was overall less shell material, including oysters, on the beach on this trip than when we were here a year ago. 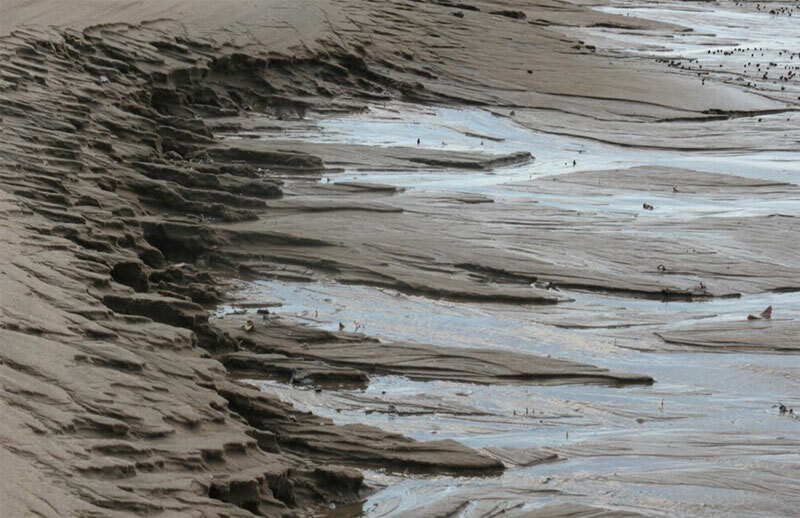 Large chunks of mud on the beach had been washed away, but mud patches could still be seen at this tidal height at the open ocean. Some small balls of mud were scattered on the beach, hardened by the sun. 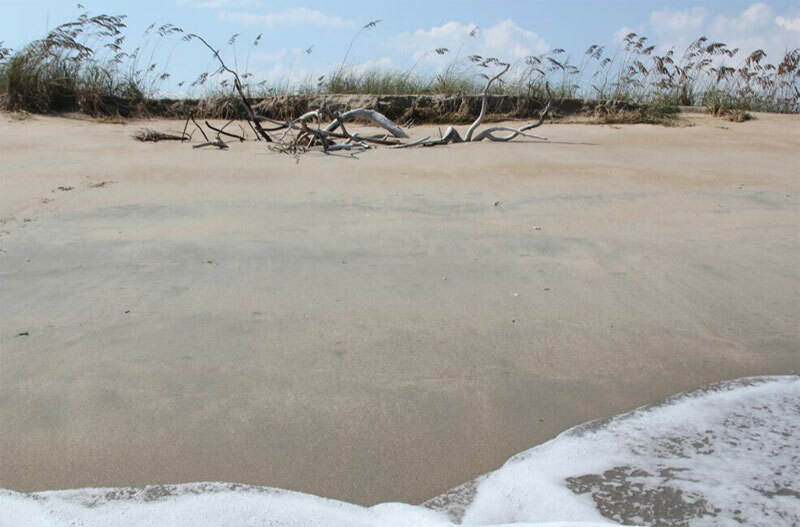 Vegetation was crushed and there were fewer Sea Oats, some of which look dead in the sand, as the ocean has crept forward. The beach was scattered with broken foliage. To the north, a forested area which extends across the island in a band remains at the ocean’s edge. Where the trees are being inundated, the beach is gone. Cape Island seems destined to be two pieces now. I suspect this breach will grow wider, with sand accumulating on both sides of the breach composed of material eroded from the beaches nearby. The beach is not just what we walk on, but all the sand that lies underwater that feeds the beach. A new sand formation might remain and accrete or get washed landward in the next storm. If plants colonize here where the birds have collected on the new sand, this ground may gain traction against the forces of the open ocean. In December I spent a couple of weeks house sitting for the Fulchers at a remote location down two long dirt roads on the mainland adjacent to the Cape Romain National Wildlife Refuge. Jim Fulcher says he’s lost 20-some odd acres to the rising sea level. He retired last year and was the town doctor in McClellanville for 40 years. 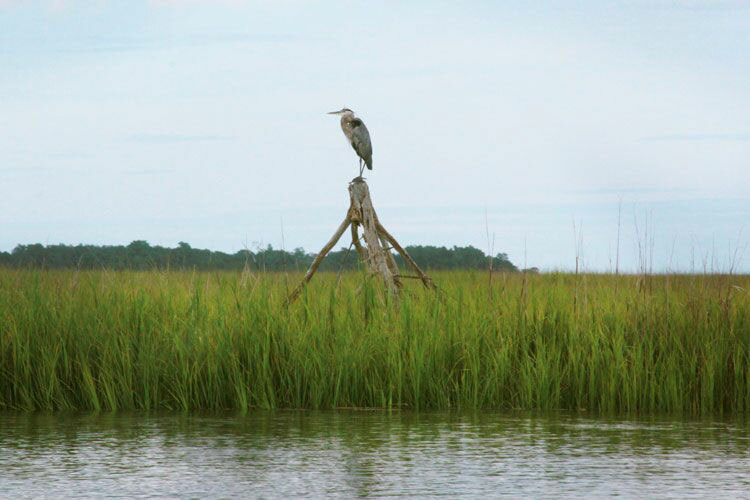 He and his wife Patty bought 140 acres on the marsh at Cape Romain years ago, before Hurricane Hugo, and many of their friends share this wooded backyard. Black Needle Rush, he says, is what defines his land from what is federally-owned. Coastal law prevents them from building on this land. Until they get it surveyed again, they pay taxes on all of it. 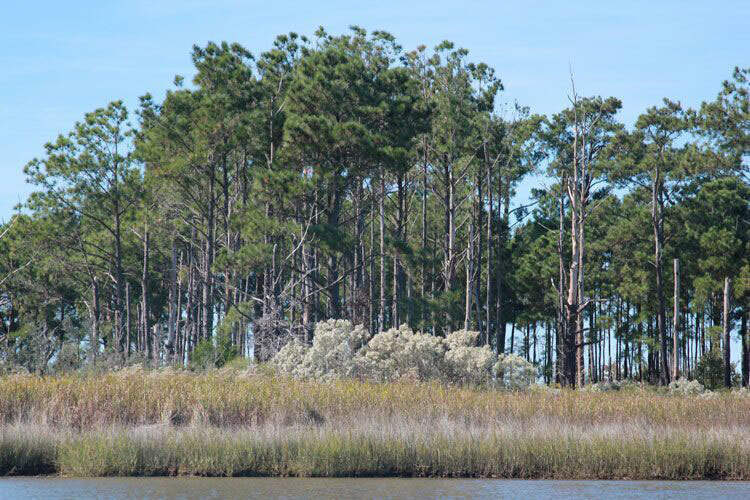 (8) The Rush grass creeps in along the sides of a dirt dike that leads out to a promontory, populated with pines, oaks, cedars, and palmettos. 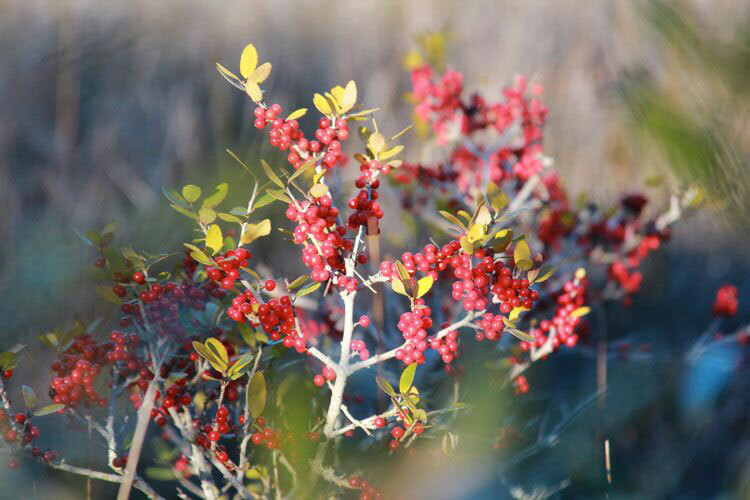 Bright red Yaupon holly berries and clusters of black Smilax berries overflowed on bushes along the dike’s bank. (9) A huge grey heron took off from a pool surrounded by the rush as I make these notes. 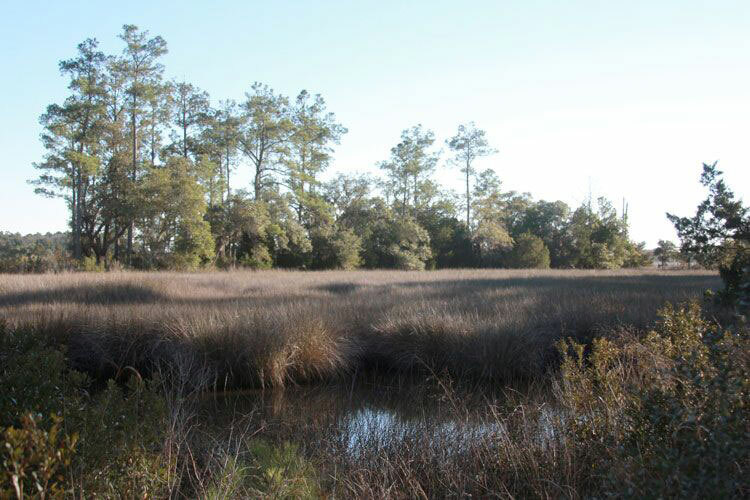 This area was carved up with dikes by enslaved people, who removed vast treed swamps to create controlled floods for rice cultivation. Perhaps this dike is one of those remnants. 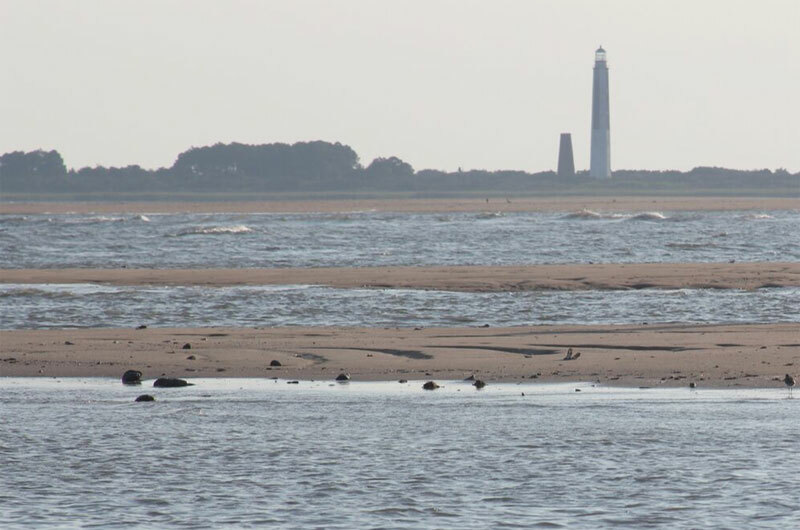 Hummocks and islands float on the horizon, and from the edge of his land on a clear day, you can see the Cape Romain lighthouse, about 8 miles away. Small creeks meander up behind forested islands and cut the higher elevation land into pockets of trees. Going out by boat here requires at least a half tide on this tiny creek. 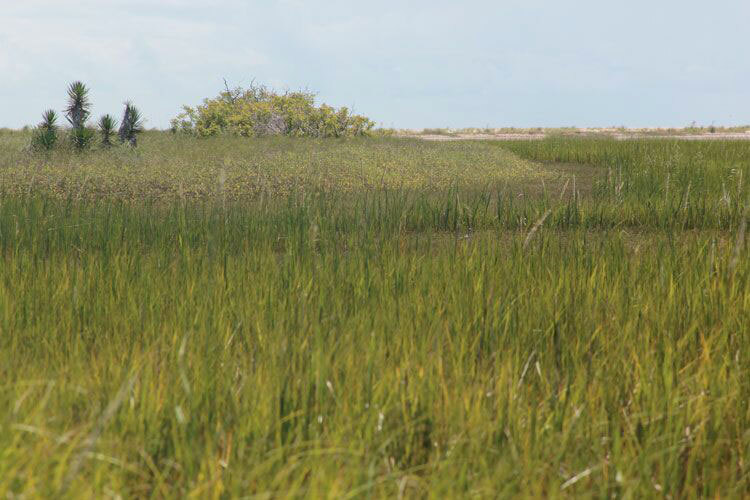 Many plants thrive on the sandy island including mosses and grasses too numerous to name. Wiregrass should be noted because it is so integral to the pine forest here. 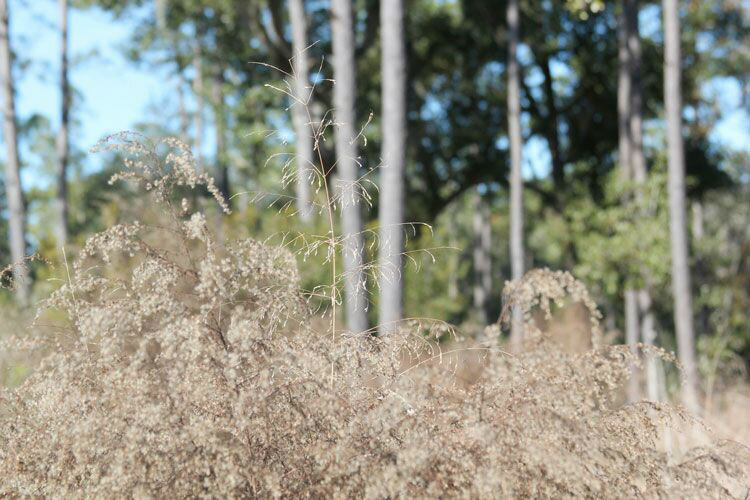 A more wooded area has branches, pine needles and other organic matter remaining in place, improving the soil quality. When it rains, this land becomes a swamp. 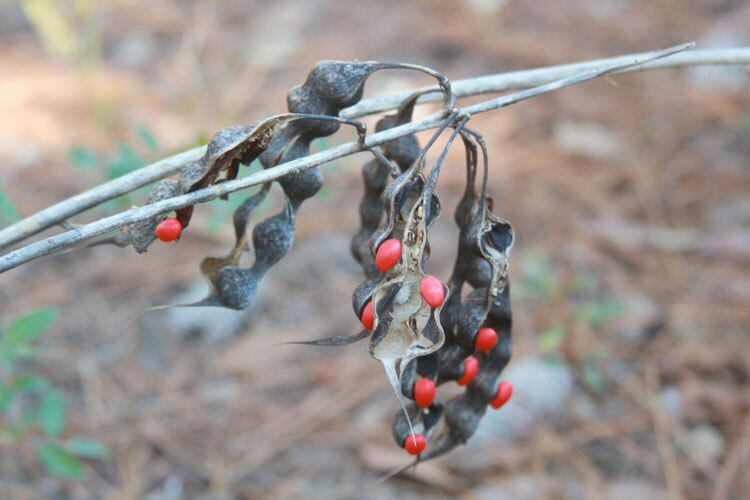 There are taller grasses, shrubs such as groundsel, calf-high hollies, and flowers gone to seed such as Goldenrod below the pines. Seeds blowing in the wind stuck to my jacket. Vines of small blackberry and Smilax were all over the ground ready to snag my leg. In the morning duck hunters can be heard blasting. Abundant berries in these woods attract many deer for the interested hunter. Quiet walks around this property stand in peaceful contrast to the force of geologic time and the span of life that harnesses beautiful diversity, yielding opportunity for endless observations. 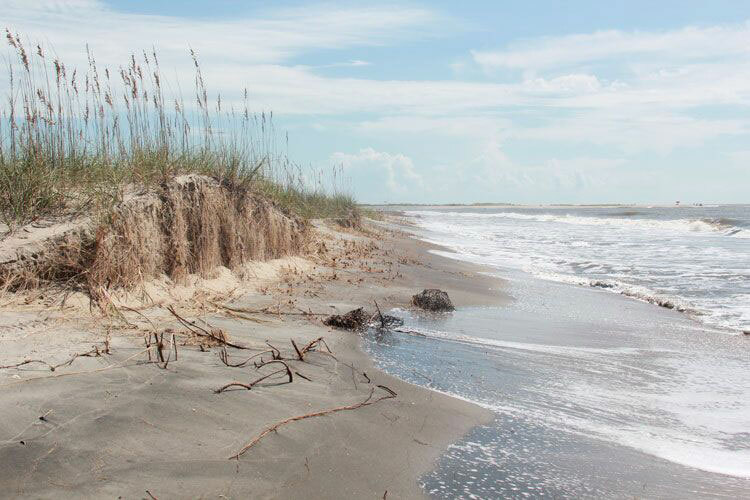 Cape Romain will keep revealing its secrets to those that listen. 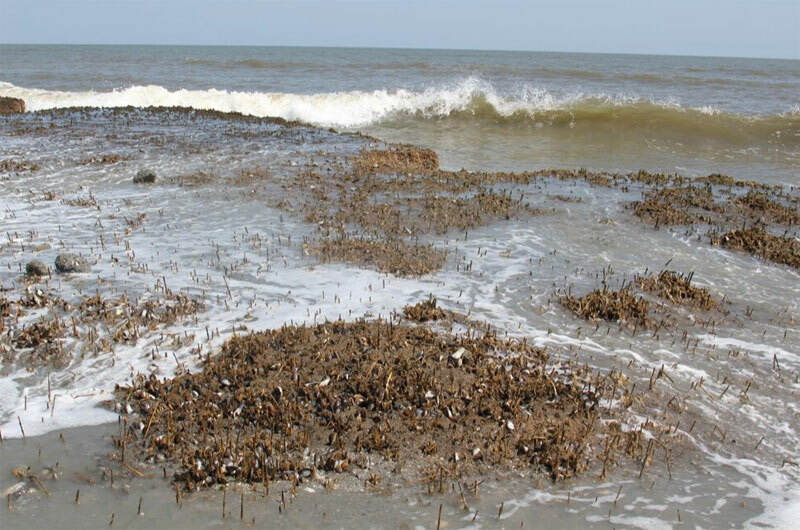 (2) The wrack line is the debris left by a high tide. 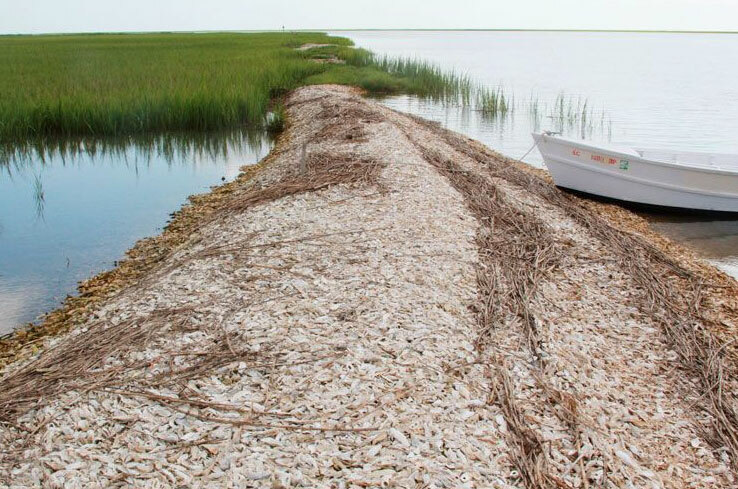 Wrack lines act like mulch, retaining water and allowing a protected environment for seed germination. 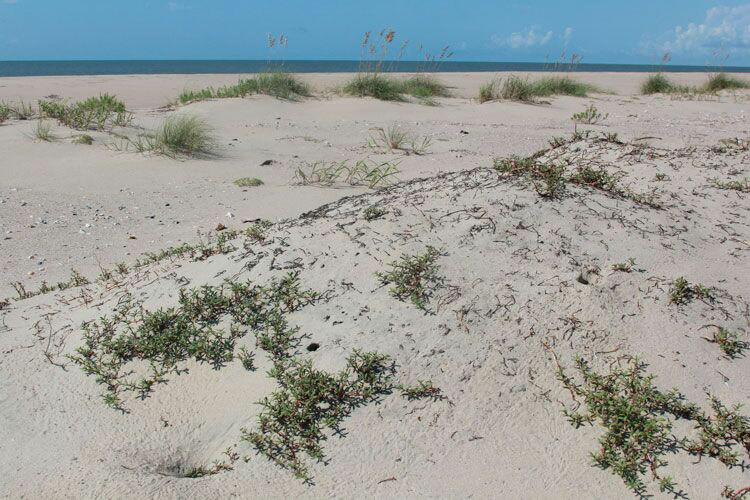 Sand accumulates around any object or vegetation on the beach, including wrack lines. 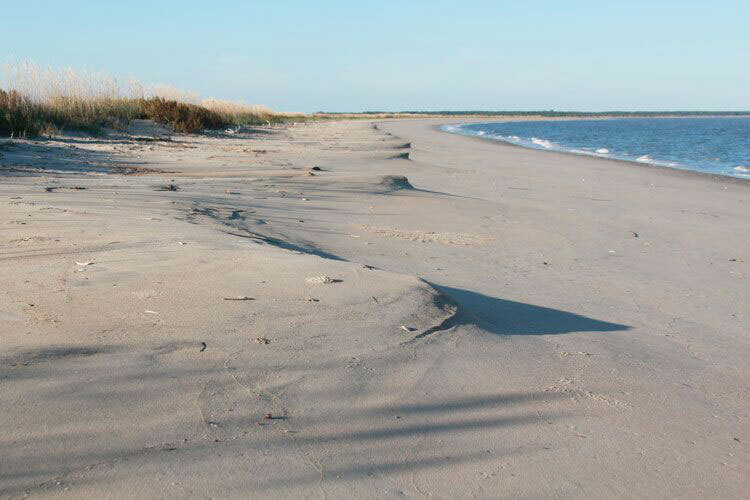 “This sand-trapping effect of natural wrack lines is a strong argument for leaving them on the beach rather than ‘cleaning’ the beach.” Atlantic Coast Beaches: A Guide to Ripples, Dunes and other Natural Features, Neal, Pilkey, and Kelley, pg 178, 185. (4) Mostly silicon dioxide or quartz compose sand but many different minerals occur. Weathering of bedrock on the continent are transported to the coast by rivers. 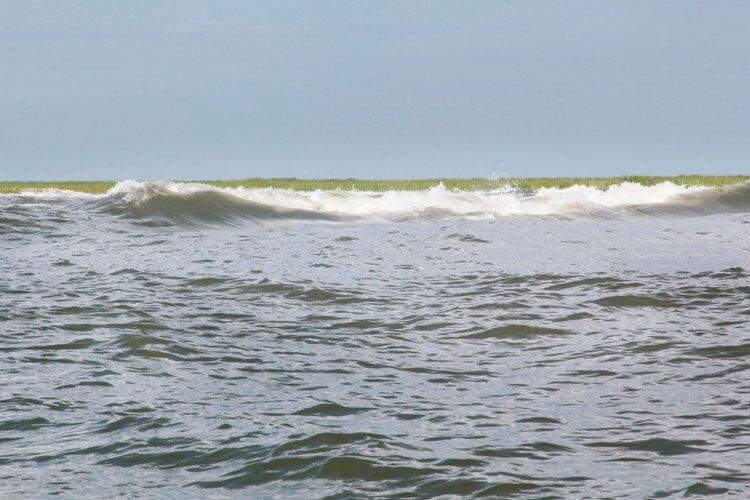 Quartz is resistant to abrasion and makes it hundreds of miles to the beach. Common are also heavy or black minerals, which concentrate in troughs or ripples. Magnetite is the most common heavy mineral in sand, and is a common iron oxide mineral. Atlantic Coast Beaches: A Guide to Ripples, Dunes and other Natural Features, Neal, Pilkey, and Kelley, pg. 74, 83-85. 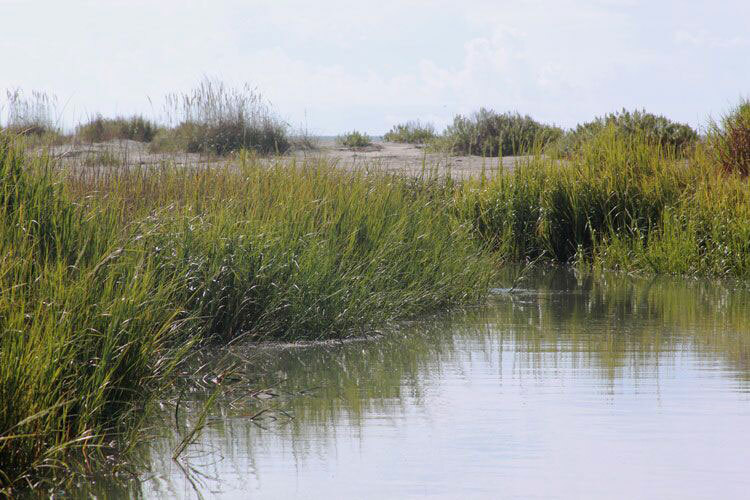 (5) The South Carolina coast here is mesotidal, meaning it has a tidal range of 2-4m. 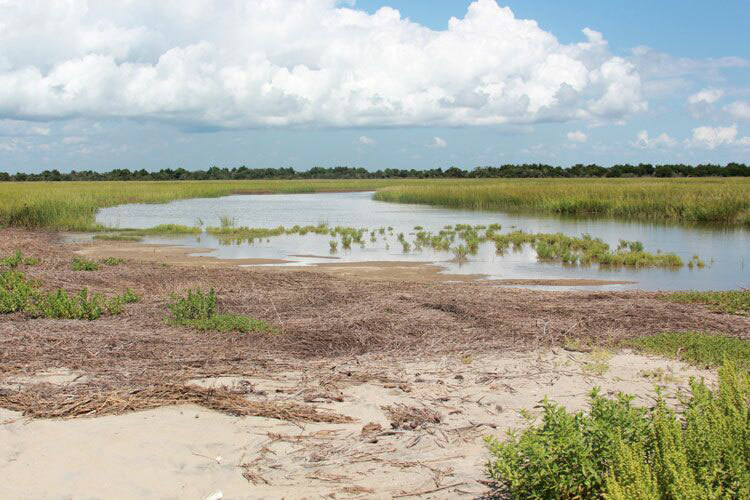 The Geologic Impact of Hurricane Hugo and Post-Storm Shoreline Recovery Along the Undeveloped Coastline of South Carolina, Dewees Island to the Santee Delta, Sexton & Hayes, Journal of Coastal Research, Spring 1991. (9) Smilax is the genus of over 300 species including the many prickly briers, also called catbrier, greenbrier, and chainey briar.